The ninth annual Danbury Dream Invitational has become a highlight of the season for Connecticut track fans and athletes who want to take part in a national-level competition right here in the Nutmeg State. The marquee match-up of the meet in the boys' mile between Spencer Brown of Wilton and Alex Ostberg of Darien never materialized after Ostberg twisted his ankle the day before and decided to sit out the race. 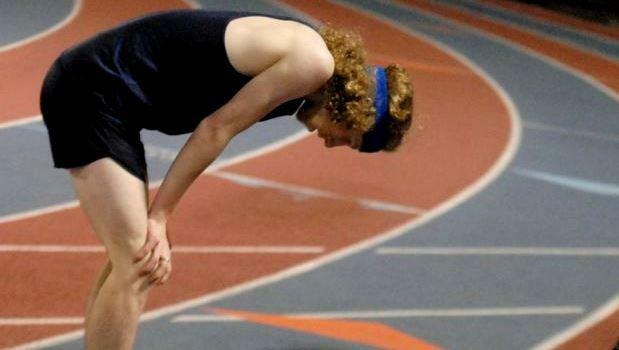 The Darien standout, showing the maturity of a veteran, was disappointed in not being able to race but stated, “I know I just need to be patient and give my ankle a couple of days to rest. This may be a good thing because this is giving me a few days off and I'm in such good shape, a couple of days now, will probably be better for me in the long run." With Ostberg out of the race it was still a battle between the indoor State Open 1,000m champion Brown, the indoor State Open 3,200m champion Eric van der Els of Brien McMahon and NXN Northeast regional champion Austin Gilbert of Ridgefield. Brown went right with the rabbit and went out the first lap in about 63 and continued to push the pace. “I really respect how Alex can set the pace and I hated being in the lead the entire time," he admitted. At the 1,200m mark, Gilbert made his move and went by van der Els on the back straightaway and looked like he was going after Brown. But while the Wilton senior didn't have his customary kick, he held it together for his second fasted time ever, a 4:12.25 clocking. Van der Els was more patient and was able to retake Gilbert on the last turn and finished second in 4:13.20, a new PR. When asked why he didn't go with Brown, the McMahon junior stated, “(I) didn't feel I could keep up with Spencer's kick and I just wanted to run a fast time." With a 6.5 second PR, consider it mission accomplished. To highlight the depth of the race, 10 of the 16 finishers broke 4:20 for the full mile distance. In the two mile, Danbury's Eric Waterman, a national qualifier in the 2,000m steeplechase, kept the pace honest for the first mile but was passed by Christian Alberico of Coginchaug. Alberico has proven to be a star in the Shoreline Conference and Class S but showed off his speed to the bigger schools with a 2:11 last 800m to put away the field. Amity's sophomore Kyle Beaudette also set a PR to finish second in 9:20.14. Probably the least hyped, but most exciting race of the day was the girl's 800m. The rabbit took the pace out quick and the top four girls went out in the 1:05-1:06 range for 400m with Danbury freshman Leah Sarkisian leading the charge. Sarkisian, the State Open runner up in the 600m this indoor season with Pomperaug's Michaela Meyer right behind in third, renewed their rivalry and came into the homestretch neck-and-neck. It looked like Meyer had some momentum and would hold on for the win, but Sarkisian wouldn't give an inch and was declared the winner by .01 seconds in 2:14.05. Danbury's three other runners in the race Abigail Llanos (2:19), Olivia Turk (2:24) and Gabriela Collado (2:29) would have combine to run a 9:26 4 x 800m and a top 80 time in the country. In other action, Ridgefield's Jon Keating led wire-to-wire, defeating Wilton sophomore Aaron Breene in 1:56.42. But right behind them in places three to eight, six finishers came across the line, separated by just 1.3 seconds and under two minutes. The girls' 4x200m was won by Fairfield Ludlow in 1:46.76 over Danbury in 1:48.18 and in the field events, Anthony Bravo of Staples went for 6 feet, 7 inches but missed and had to settle for 6-4. All-American pole-vaulter Chris Rough of Westhill broke the FCIAC record in the event with a jump of 15-6 to take the win.